Richard Hannay is bored. Annabella Schmidt is a beautiful secret agent with a mysterious accent. He takes her home, but she ends up murdered, and suddenly he is on the run from a foreign power called “The 39 Steps.” A plane crash, hand cuffs, missing fingers and more than a little old-fashioned romance spill across the stage as Richard searches for answers. Part Hitchcock movie, part classic spy novel and 100% love song to the magic of the theater, this fast-paced farce features a cast of four portraying more than 150 characters. Watch the video: Five minutes of tech in 30 seconds! Don't we all wish tech rehearsals went this quickly? Five minutes of tech in 30 seconds! Don't we all wish tech rehearsals went this quickly? 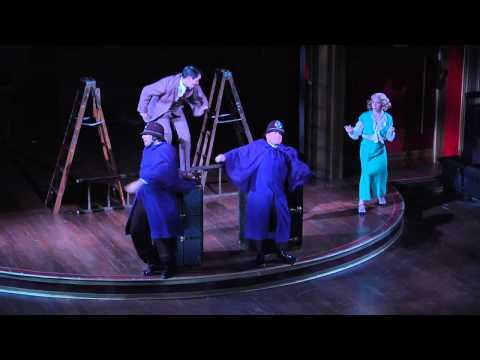 Watch the video: A Sneak Peek at THE 39 STEPS at Triad Stage: Get a behind the scenes look at THE 39 STEPS at Triad Stage with Director Jen Wineman and actors Sal Cacciato and Andy Paterson. A Sneak Peek at THE 39 STEPS at Triad Stage: Get a behind the scenes look at THE 39 STEPS at Triad Stage with Director Jen Wineman and actors Sal Cacciato and Andy Paterson. 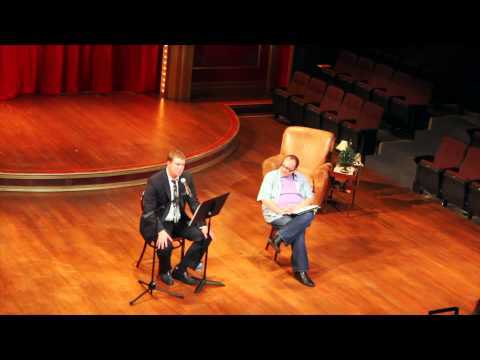 Watch the video: InSight Speaker: Featuring Will Dodson, faculty-in-residence at UNCG, where he teaches rhetoric, literature and media studies. His film courses include surveys of Hollywood muiscals, cult films and thrillers. InSight Speaker: Featuring Will Dodson, faculty-in-residence at UNCG, where he teaches rhetoric, literature and media studies. His film courses include surveys of Hollywood muiscals, cult films and thrillers. A hilarious romp through a spy novel, THE 39 STEPS, directed by Jen Wineman, combines a light plot of murderous mystery with the creativity of improv and the oh-so-appreciated “simple” humor of an “SNL” skit. The cast in the Triad Stage production of THE 39 STEPS, under the direction of Jen Wineman, pulled off the gambit with tight precision and rollicking interpersonal chemistry during the Sept. 5 premiere in Greensboro, which also inaugurated the theater’s 2014-15 season. If Triad Stage’s THE 39 STEPS is any indication of what the company has in store for audiences this season, then the triad must brace itself for brilliance. Theatre Review: "The 39 Steps"
Featuring four actors, 150 characters, and lots of hilarity, THE 39 STEPS is a high energy farce that will keep audiences in stitches from beginning to end. The play takes the story in a slapstick, madcap direction. Four actors perform more than 150 roles, frequently switching characters multiple times in the same scene.